The Samsung Galaxy Note 4 is one of the most powerful smartphones on the market, but it’s also one of the most expensive. This means that you’ll certainly want to keep it protected in some form or fashion – because who wants to use a scuffed up Galaxy Note 4 with a shattered display? 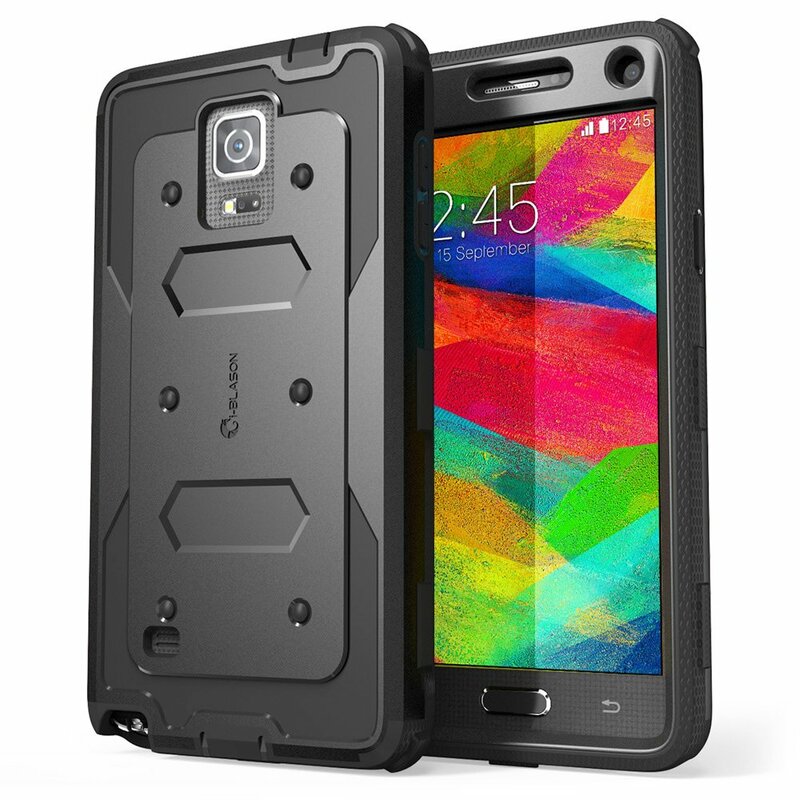 In this article I’ll be going over the top must buy cases for the brand new Samsung Galaxy Note 4. And just to clarify, this list isn’t in any particular order. The Tough Armor Kick Stand Case from Spigen is definitely on the higher end when it comes to pricing, but it’s definitely justified with the case’s slim profile, kick stand functionality, and great premium feel. 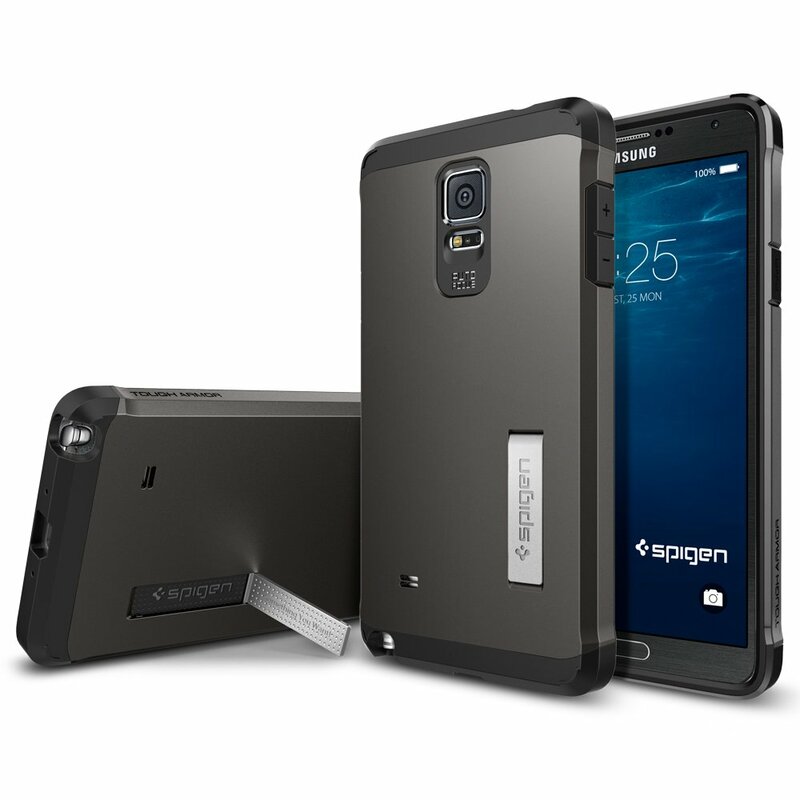 To start, the Spigen Kick Stand Case for the Galaxy Note 4 is comprised of two different pieces, a TPU and polycarbonate. The polycarbonate is more of a tougher material while the TPU has a softer shock absorbent finish. The benefit to this two piece design is that you get the comfortable grip of a poly carbonate backing while also getting another protective layer with the rubbery edges. One would assume a dual layered case would be as thick as a ream of paper, but it’s actually surprisingly slim and light. Considering the Note 4 is a mere 174 grams to begin with, the extra weight actually gives the phone some nice heft to it. When it comes to the functionality of the accessory, it’s really one of the best out there. Most cases don’t have a kickstand, and if they do they’re extremely bulky and ugly like the one in the image to the right. Spigen really got it right with this kickstand – it’s not too flashy or big, but at the same time it isn’t too subtle. 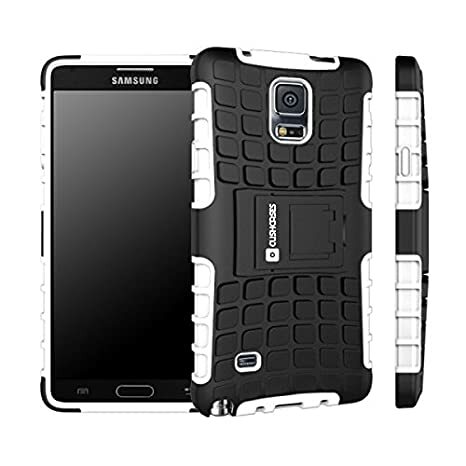 As far as color options go you can purchase the Spigen Tough Armor Kick Stand Case for the Galaxy Note 4 in several different variants which range from satin silver to electric red. If you’re interested in checking out the product page you can find it below. i-Blason is a very reputable company when it comes to creating cases. I’ve been using their products for years and haven’t come across any issues, and the Armorbox Dual Layer Protective Case is no exception.